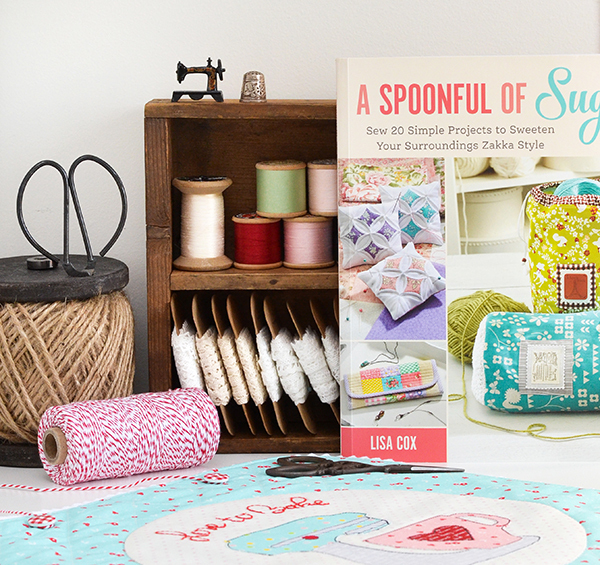 Welcome to my stop on the blog tour for my talented friend Lisa Cox' first book, which bears the same name as her adorable crafts & baking blog, A Spoonful of Sugar. 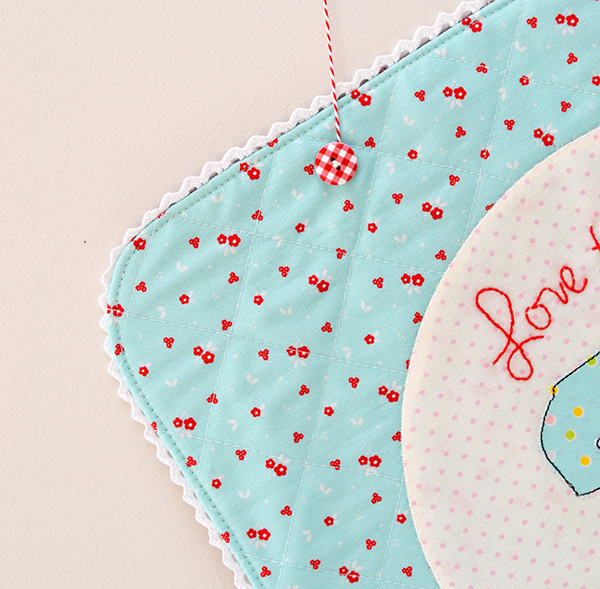 And the name says it all, just like her blog, Lisa's book is packed with the sweetest zakka projects! Please allow me to digress a little bit before I show you what I made from Lisa's book... Those following me on Instagram would have seen a few little snippets of my sewing for spring quilt market in Salt Lake City. I have been a busy little sewist these last few weeks, making things to adorn my booth for the launch of my debut fabric collection, Sweet Orchard for Riley Blake Designs. I haven't yet shared many of those projects yet as my collection is coming out in August, and I don't want you to get sick of them too soon! All will be revealed, in good time. So, with only two weeks to go before I get on a plane to the States, time (and sleep) has become a very scarce commodity - therefore I decided to kill two birds with one stone, and make not just one but two projects from Lisa's book with my Sweet Orchard fabrics, and as a bonus I could take them along with me to display in my quilt market booth. Win win! If you would like to see these projects in real life, they will be up for display in my Sweet Orchard booth at spring quilt market in Salt Lake City, 20-22 May. I will be in booth 2123 in the Riley Blake 'village', so if you happen to be there too please pop over to say hi! 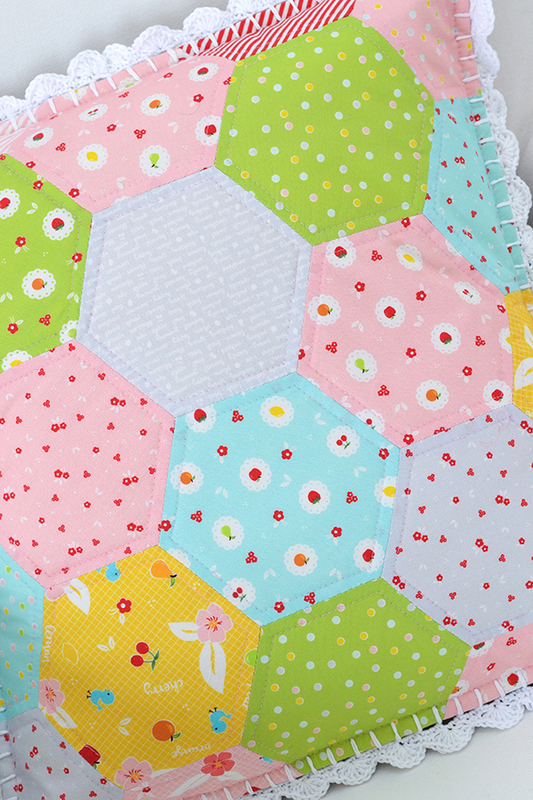 First up I made the retro hexie pillow. This cushion would have been so quick to make, only if I wasn't being such an overachiever by diverging from the book and having the bright idea to quilt the pillow front. Which is all fine and dandy, but hand sewing the blanket stitch around the perimeter was a total pain in the backside with the thickness of the batting. So learn from my mistake - if you are intending to add a crocheted edge, either skip the quilting altogether or use thin batting! Believe me, your fingers will thank you for it. Despite the crochet edge setback, I really love the final result, and it gives me such a thrill to see things made with fabric that I've designed and being able to share them with you (cue soppy moment). 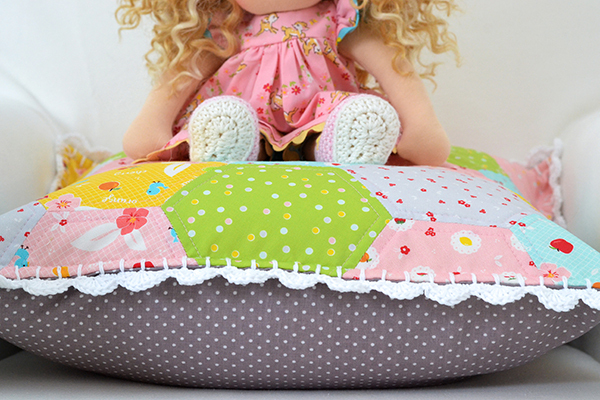 I hope you like the pillow and fabrics too! 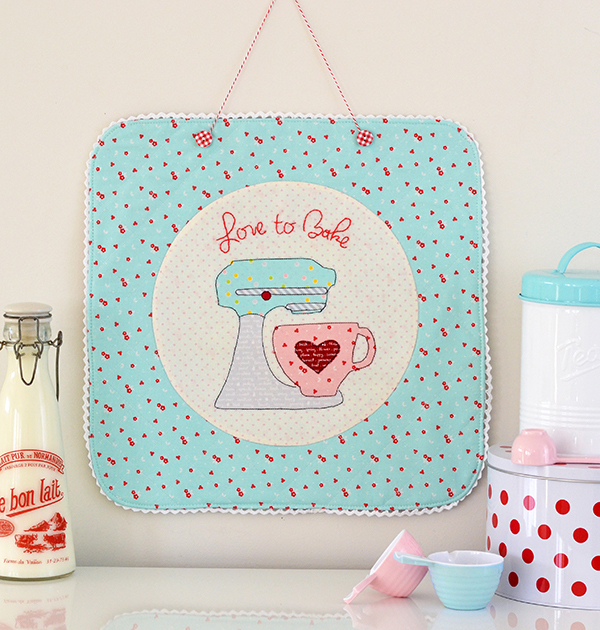 The second project I made is the 'Love to Bake' wall art. 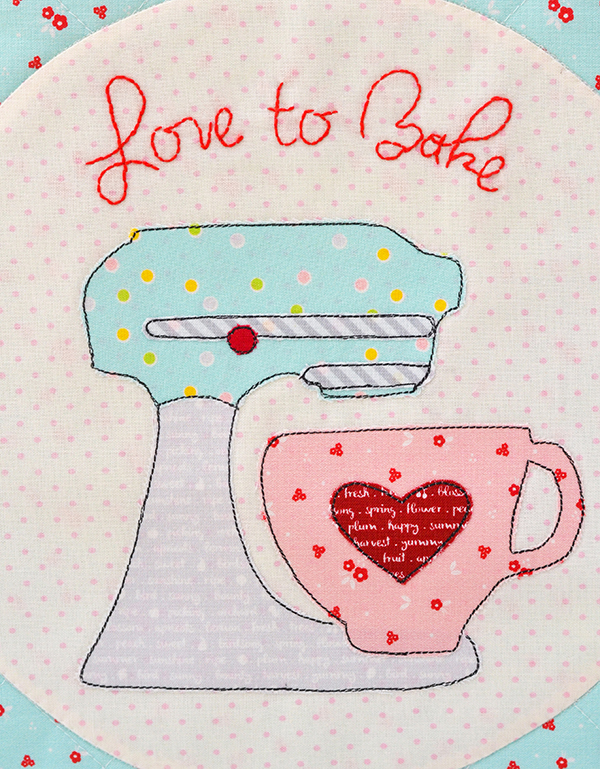 I think I will put this on the mini-wall in my sewing room rather than my kitchen, as I love it so much. And it may get me motivated to get out of my sewing room and bake more! I have a confession here - I meant to make it as a hoop art, as it is shown in the book. But I had (yet another) mishap. 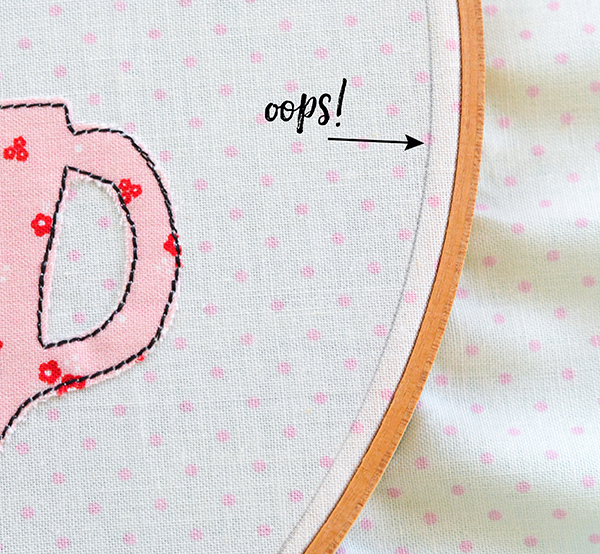 I finished the applique, and when I tried to stretch it onto the hoop, I noticed that when I was marking the hoop on the fabric I traced along the inside of the hoop rather than the outside, and in pencil too. Arrrgh!! It was too big to stretch onto a smaller size hoop, so I decided to salvage it by turning it into a circular applique (using fusible interfacing) for a wall hanging instead. I'm pretty pleased with how it turned out actually! 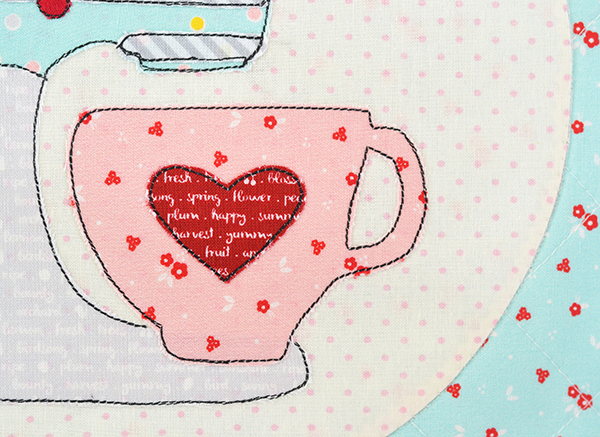 Sending a big thank you to Lisa for inviting me to sew in her blog tour. Here's a list of all the bloggers participating in the tour, so pop over to their blogs and see what they made! 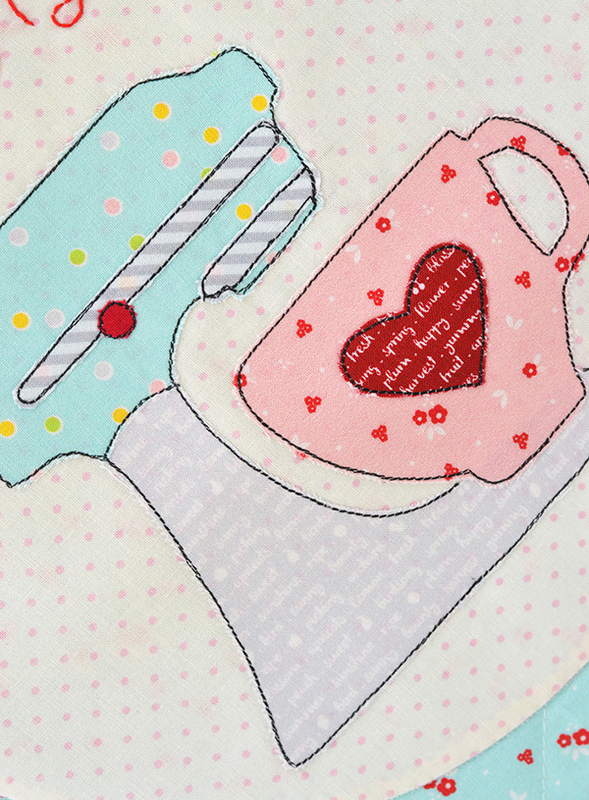 If you would like to sew with Lisa's book too please join us for an Instagram Sew Along from June 1 – August 9. 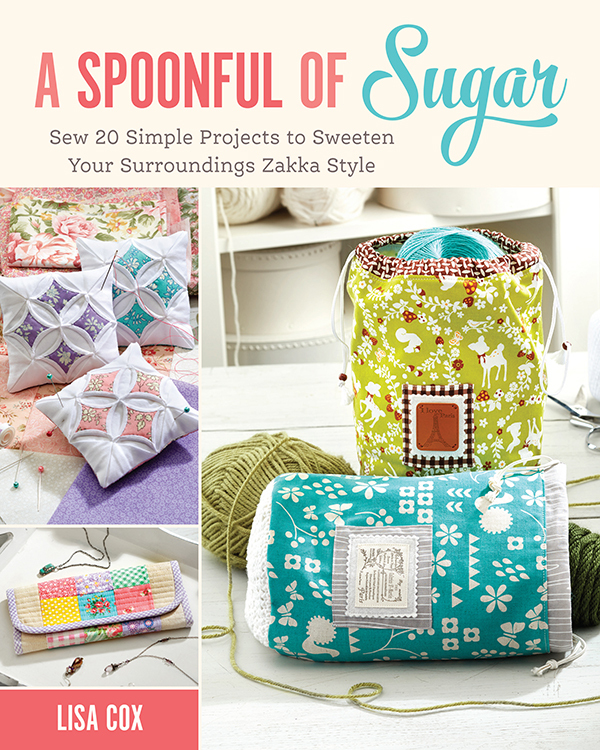 We will be making projects from A Spoonful of Sugar: Sew 20 Simple Projects to Sweeten Your Surroundings Zakka Style. There will be five rounds, each lasting for two weeks which will give you plenty of time to complete a project or two from the book. Our good friend, Amy Sinibaldi from Nana Company is the Guest Judge, with fantastic prizes for the winner of each round, plus a Grand Prize Winner, generously sponsored by Alisha from Ministry of Fabric. We really hope you join in the fun! I love your creation of both projects, you do such a beautiful job. I can't wait to have this book, really cute projects. 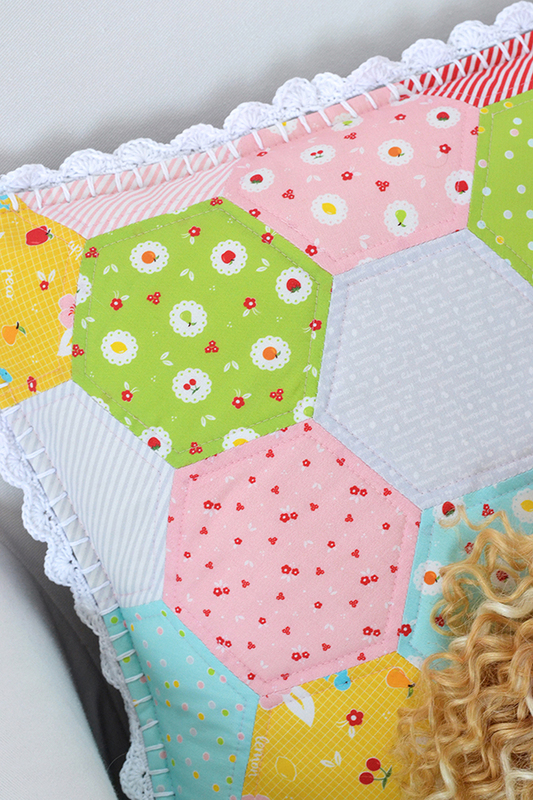 Your fabric collection is so sweet, I am very excited to get a bundle. 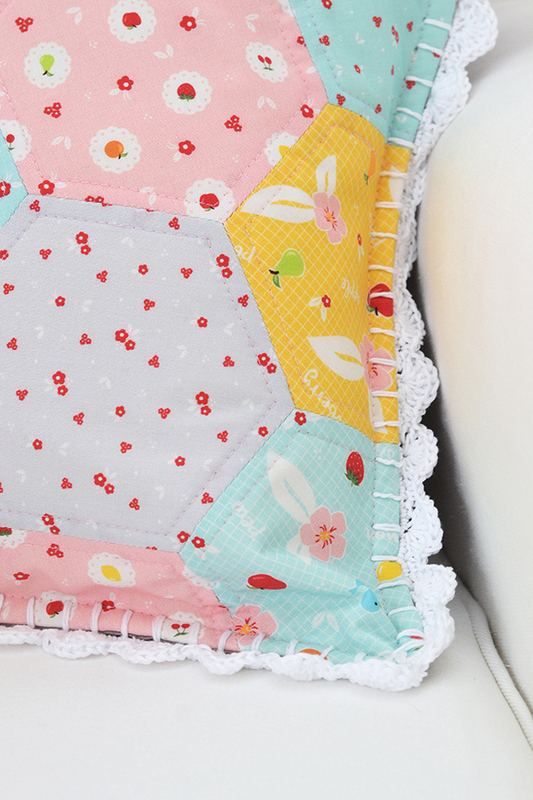 That pillow is so darned cute I can hardly stand it! Well done. "Mistakes are just opportunities for creativity." You certainly shine in that department. The wall hanging is wonderful - I love how you did that. 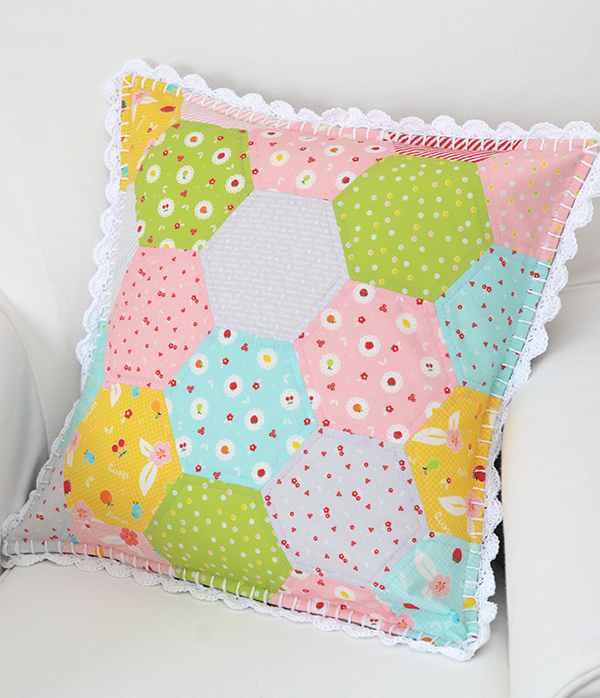 The pillow is a win, win with adorable fabrics, hexies, the quilting, and the fabulous crocked edging. Wonderful! These are just too cute!! The fabrics are just beautiful! 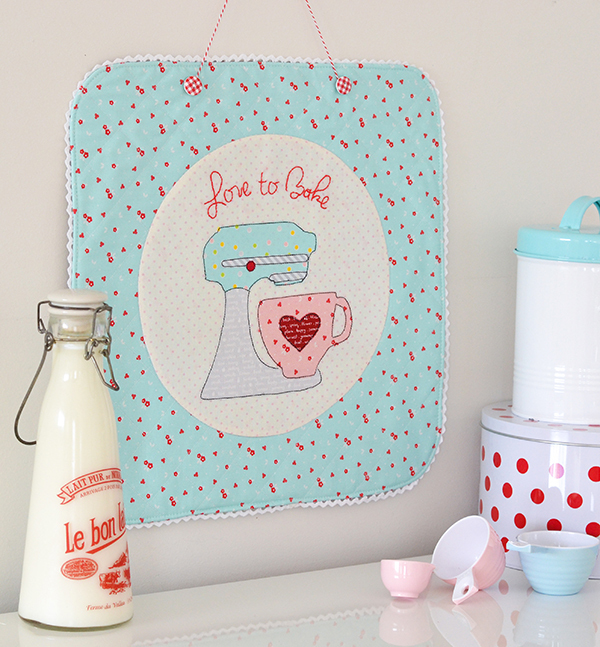 and I love the baking wallhanging....nicely done! Cute pillows. I want a pillow like this. It helps me sleep better daughter.